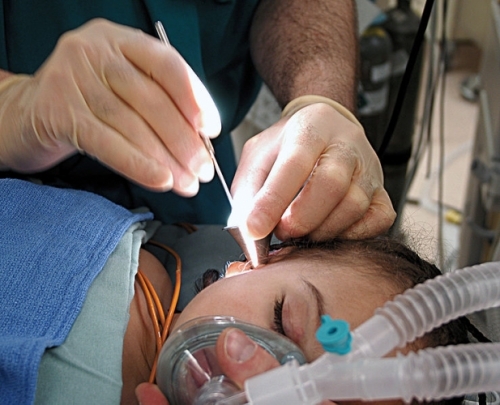 Every year, millions of children undergo surgery to have tubes placed in their ears. UNC researchers are reviewing years of studies to see whether this common surgery is always necessary. Ear tube placement is the most common pediatric surgery performed in the United States. One of out 15 children have tubes placed in their ears by the time they enter elementary school. Some of my first memories from childhood are of terrible earaches. By the time I was three years old, I had been treated for ear problems six different times. After the sixth visit, my pediatrician referred me to an ear, nose, and throat doctor, who diagnosed me with chronic otitis media with effusion (OME), or fluid in the middle ear. The doctor scheduled me for surgery the very next day to get tubes placed that would drain the fluid from my ears. But I never went. My mom read about the procedure and some of the potential side effects. “The procedure was never threatening to me,” she says. “I just didn’t want my three-year-old child to be put under anesthesia.” She cancelled the surgery. Millions of children—1 out of 15—have tubes placed in their ears by the time they are school aged, according to Michael Steiner, a researcher in the Department of Pediatrics at the UNC School of Medicine. It’s generally a low-risk procedure done with outpatient anesthesia. But is it necessary? It wasn’t for me—the fluid in my ears eventually cleared on its own. My hearing is good, and I haven’t had any ear issues in almost two decades. Now, researchers at UNC, in partnership with RTI International, are looking at whether tube placement is children’s ears is the best way to treat this common condition. Both Steiner and Wallace say that it’s considered best practice to avoid doing surgery on a child unless it’s absolutely necessary. So if opting out of the surgery produces the same outcome, then why get it? For generally healthy children who don’t have other kinds of issues, the best approach may be “watchful waiting,” according to Steiner. The child goes to checkups every few months and the physician makes sure the fluid is clearing up and hearing is returning to normal. That worked just fine for me. But the concern with this approach is that the child’s hearing and development may suffer while fluid is present in the middle ear. According to Wallace, the hearing can fluctuate. “That could make it even harder to learn language because of the inconsistency in hearing sounds,” she says. For 95 percent of children who are diagnosed with OME and don’t receive treatment for it, the fluid in the ears clears up naturally within 7 to 12 months, according to Wallace. So which is worse? Dealing with fluctuations in hearing for a couple of months, or undergoing surgery? It ultimately depends on the child—or more often, on the parent. Either way, if the child is healthy, his or her ears are likely to turn out fine. Michael Steiner is an associate professor and chief of the Division of Pediatrics and Adolescent Medicine in the School of Medicine at UNC. Ina Wallace is a senior research psychologist at RTI International.